NEW ORLEANS, Louisiana, November 5, 2010 (ENS) – A Louisiana ship-operating company was sentenced to pay $2.1 million on charges related to the illegal discharge of oil into the oceans, the U.S. Justice Department announced today. In U.S. District Court in New Orleans, the company Offshore Vessels LLC pleaded guilty on July 22 to knowingly discharging waste oil from one of its vessels, in violation of the Act to Prevent Pollution from Ships. 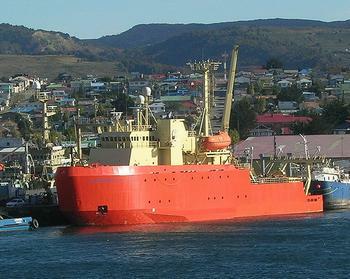 Offshore Vessels owned and operated the R/V Laurence M. Gould, a 2,966 gross ton American-flagged icebreaker that served as a research vessel for the National Science Foundation on research voyages to and from Antarctica. In its guilty plea, the company admitted that on or about September 8, 2005, on the high seas, R/V Gould crew members knowingly discharged oily wastewater from the bilge tank of the ship overboard. In doing so, they bypassed the ship’s oily-water separator, a pollution-control device. The Act to Prevent Pollution from Ships requires that oily wastewater be discharged only after it has been sent through an oily water separator. Offshore Vessels was sentenced to pay a criminal fine of $1,750,000 and remit a payment of $350,000 as community service to the National Marine Sanctuary Foundation. The community service funds are to be used to study polar water pollution and protection of vulnerable marine ecosystems in the Antarctic region. Offshore Vessels also will serve a period of probation for three years, during which it will be required to operate under an Environmental Compliance Plan. “The criminal fine in this case will serve as a strong deterrent to all vessel companies, American and foreign, against deliberately violating the laws enacted to protect oceans,” said Ignacia Moreno, assistant attorney general of the Environment and Natural Resources Division of the Department of Justice. “This case is particularly egregious because the defendant is an American company tasked with providing passage for the National Science Foundation in order for it to perform important environmental research in Antarctica,” she said. “The required payment will provide a means of studying polar water oil pollution and its impact on Antarctica’s fragile marine ecosystem,” Moreno said. The case was investigated by the U.S. Coast Guard Criminal Investigative Service.